The leader of the Australian state hardest hit by the country's worst-ever wildfires said Tuesday the death toll would exceed 200. The confirmed death toll stood at 181 Tuesday evening, but Victoria state Premier John Brumby said the coroner had identified another 50 bodies that had not been counted in the official death toll. Brumby told reporters that the toll would "exceed 200 deaths." Authorities searching for answers to the carnage said Tuesday they would rethink policies allowing residents to decide for themselves whether to evacuate their homes. Officials defended their preparation and actions during the fires that swept unchecked across southeastern Australia last weekend, saying the weather conditions were so extreme that it was almost impossible to avoid some level of catastrophe. Teams moving into towns burned out by the inferno found charred bodies on roadsides and in crashed cars - grim signs of futile attempts to flee raging wildfires fed by 60 mph winds, record heat and drought. Suspicion that some of the 400 blazes were caused by arson has led police to declare crime scenes in some incinerated towns. Police assistant Commissioner Dannye Moloney, who was appointed Tuesday to head the task force investigating the fires, said officials were preparing to release a sketch of a suspect in one of the fires, which killed 21 people. CBS News correspondent Barry Petersen reported that the usual sentence for arson in Australia is anything up to 25 years in prison. However, if someone is apprehended in this case, they're expected to face murder charges, which can carry a life sentence. The fires near Melbourne, a southern city of some 4 million people that is Australia's second largest, destroyed more than 750 homes, left 5,000 people homeless, and burned 1,100 square miles of land, the Victoria Country Fire Service said. Three days after the worst single day of wildfires in Australia's history, officials said their ferocity, pace and breadth made them impossible to fight effectively. Still, this disaster would likely rewrite the books on what is considered best practice for handling fires, including the widespread policy of allowing residents in high-risk areas to decide for themselves whether to stay or flee. The policy recognizes that Australia's wildfire services - made up largely of volunteers - lack the resources to protect every house; thus, homeowners are allowed to try to protect their own property. "It is the application of that policy and a lack of an alternative that we need to work on," Country Fire Authority chief Russel Rees told reporters Tuesday. But he conceded that evacuation orders were unlikely to be heeded by all, and would be hard to enforce during a fire emergency. In Victoria, there is no formal alert system of text messages or phone calls to warn residents of approaching wildfires, though the state's Country Fire Authority regularly posts updates to its Web site on individual blazes along with advice on what residents should do. The service's updates are also broadcast over the radio. In the worst conditions, like Saturday's, the direction and intensity of fires can change so quickly that sirens, e-mail and other possible warning systems are not effective, officials say. Victoria state Premier John Brumby said a national emergency warning system for wildfires should be considered, and that he wrote to Prime Minister Kevin Rudd about the idea months ago. 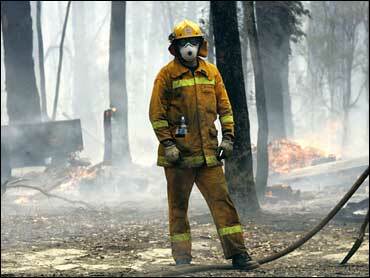 The scale of the disaster shocked a nation that endures deadly firestorms every few years. Officials said panic and the freight-train speed of the walls of flames probably accounted for the unusually high death toll. "Fire holds a great terror for us all - its power, its speed, its roar, its relentless destruction, its capricious shifts in course, its wont of mercy," Rudd told Parliament, which suspended normal debate for a second day to hear condolence speeches. The possibility of arson, "leaves us speechless," he said. "There is no excuse for this, none at all. This ... is simply murder on a grand scale." President Barack Obama telephoned Rudd on Monday night to convey his condolences to the victims. Obama offered U.S. assistance to help with the fires. Firefighters on Tuesday were still battling more than a dozen blazes that burned out of control across Victoria state, although conditions were much cooler than Saturday. Forecasters said temperatures would rise later this week, posing a risk of flare-ups. Survivors gathered at emergency relief centers looking for loved ones and accepting handouts of food and clothes. Welfare groups began taking in injured animals. Troops were deployed to collect bodies still being discovered in the ruins. At Beechworth, 125 miles (200 kilometers) northeast of Melbourne, the local low-security prison offered 30 inmates to help, general manager Terry Jose said. Of Australia's estimated 60,000 fires in forests and other vegetation each year, about half are deliberately lit or are suspicious, the government-funded Institute of Criminology said earlier this month. Donna Bateman, whose home in Kinglake West burned to the ground with her pets inside, said firefighters barely had a chance. "Everyone has a fire plan. People prepare for this for months," she said. "But the fire service told me that a fire that usually takes a day to travel had traveled three-quarters of a mile in an hour to my property. Now everything is gone."